Although mice, like most mammals, typically view the world with a limited color palette – similar to what some people with red-green color blindness see – scientists have now transformed their vision by introducing a single human gene into a mouse chromosome. 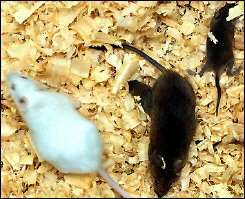 The human gene codes for a light sensor that mice do not normally possess, and its insertion allowed the mice to distinguish colors as never before. The new abilities of the genetically engineered mice indicate that the mammalian brain possesses a flexibility that permits a nearly instantaneous upgrade in the complexity of color vision, say the study’s senior authors, Gerald Jacobs and Jeremy Nathans. “What we are looking at in these mice is the same evolutionary event that happened in one of the distant ancestors of all primates and that led ultimately to the trichromatic color vision that we now enjoy,” said Nathans. Trichromacy is dependent on three types of photoreceptor cells in the retina that preferentially absorb lights at different wavelengths. These are known as cone cells and each type contains a particular kind of light-absorbing sensor protein. Short-wavelength-sensitive (S) cone cells are most sensitive to blue lights, medium-wavelength-sensitive (M) cone cells are most sensitive to green lights, and long-wavelength-sensitive (L) cones are most sensitive to red lights. When light strikes the retina and activates the cone cells, the brain compares the responses of the S, M, and L photoreceptors, and it is the brain’s assessment of their relative levels of activation that we perceive as color. Most mammals, including mice, are dichromats, possessing only S and M cone pigments. As a consequence, they can distinguish only a fraction of the wavelengths that can be distinguished by humans. John Mollon at the University of Cambridge has suggested that the evolution of trichromacy could have permitted primates to discriminate between unripe fruit, which is typically green, and ripe red- and orange-colored fruits. Reciprocally, the colors of ripened fruits may have coevolved with primate trichromacy, since animals that could recognize and eat the ripe fruit would have assisted plants by spreading their seeds. Nathans, a Howard Hughes Medical Institute researcher at Johns Hopkins, worked out the structure of the human S, M, and L pigments and the genetic basis of human color vision variation beginning in the 1980s. At the same time, Jacobs, at UCSB, deciphered the distinctive genetic mechanism that gives rise to trichromatic color vision in New World (South American) primates. Together, their work has suggested that the type of trichromatic color vision that New World monkeys possess may also be the evolutionary precursor to the form found among Old World (African) primates, including humans.